When the kids are hungry after some dedicated trick-or-treating this Halloween, they’ll be in need of some simple snacks to lift their spooky spirits and keep them away from all that candy! 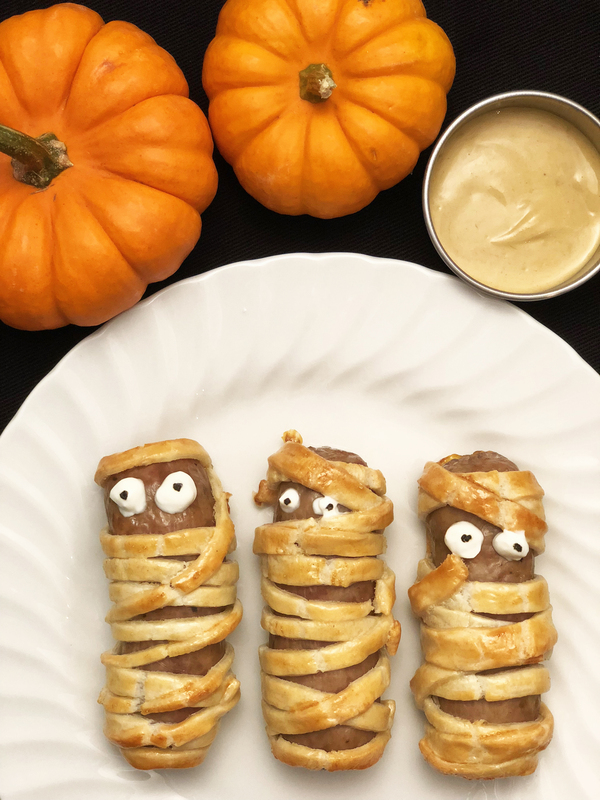 Luckily for you, this sausage mummy recipe is yummy, easy to make and themed just for Halloween! 1. Preheat your oven to 375°F. On a clean surface like a cutting board, lay out your sheet of shortcrust pastry and cut into long, thin strips to make the mummy bandages. Taking each of your uncooked sausage links, wrap a strip of pastry around in one direction, then wrap another strip in the opposite direction, leaving some open space beneath the top of the sausage to make the mummy’s face. 2. When your sausages are sufficiently wrapped, place them on a baking sheet lined with parchment paper. Brush each sausage lightly with your beaten egg and place in the oven to bake for 20 to 25 minutes or until the pastry is golden and the sausages are fully cooked. Remove and let cool. 3. While your sausage mummies are cooling, make your honey mustard dip by combining your mustard, honey and creme fraiche in a small bowl and mixing until smooth. Transfer to a small serving dish. 4. When your sausages have cooled down, place them on a serving platter and combine your mustard powder with equal parts water to make the material for the mummies’ faces. Place your mustard powder mix in a piping bag and add two small eyes to each sausage in the open space you left for the face. Serve your completed mummies with the honey mustard dipping sauce. Boo! Never tasted sausage as delicious as our Premio Sweet Italian Sausages? Neither have we. Try all our sausage varieties today by searching for Premio products in a store near you.